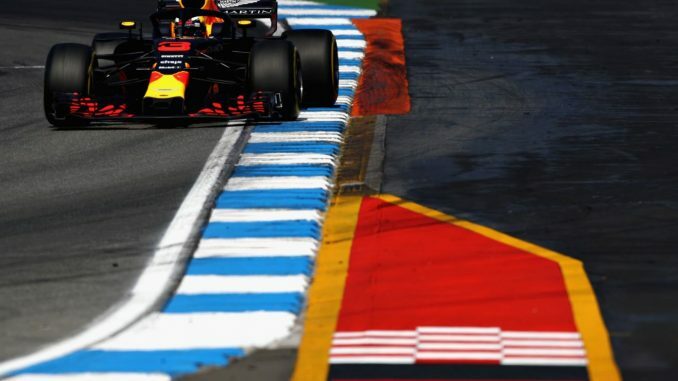 Red Bull’s Daniel Ricciardo and Max Verstappen each topped the timesheets in one session at Friday practice for this weekend’s German Grand Prix. 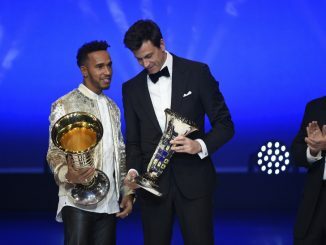 It was Ricciardo who made the fastest start at the Hockenheimring, narrowly beating Lewis Hamilton in the morning session, before Verstappen ended the day with a new outright track record, despite completing just 18 laps in FP2. Ricciardo slipped down the order in the afternoon as he focused on race pace. Despite his strong showing in FP1, the Australian already knows he’ll be starting from the back of the grid on Sunday after taking new engine elements for this weekend, taking him over his allowance for the season. 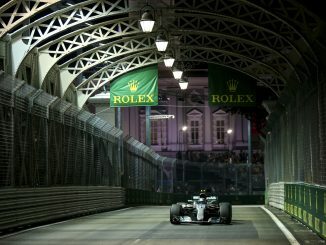 Mercedes also looked strong throughout the day, with Hamilton second fastest in both sessions and Valtteri Bottas ending the afternoon third. The Finn, whose contract extension was announced this morning, was only fifth in FP1, but set his fastest lap in that session on the soft tyres, rather than the ultrasofts used by those ahead of him. Ferrari appear to have brought a few upgrades for this race, including a new exhaust, but they were around 0.2s off Mercedes’s pace, despite Sebastian Vettel completing more laps than any other driver in FP2. Kimi Raikkonen was around 0.5s slower than his teammate in FP1, but closed the gap later in the day. Haas were the best of the rest in both session, with Romain Grosjean and Kevin Magnussen finishing just ahead of Sauber’s Charles Leclerc. The rookie Monagascue driver was comfortably the quickest driver in his team, with reserve driver Antonio Giovinazzi taking Marcus Ericsson’s car out in FP1, before the Swede returned in the afternoon, ending the day 0.4s adrift of Leclerc. Giovinazzi’s time in the car was cut short as his engine cover came off during one of his runs, forcing him to return to the garage early. It looks like Renault and Force India will battle it out for the final places in the top 10, with Nico Hulkenberg just ahead of Esteban Ocon and Sergio Perez in FP2. Like Sauber, Force India had their reserve driver in the car this morning, with Nicholas Latifi filling in for Ocon. Missing the morning didn’t seem to affect Ocon’s performance though, as he beat his teammate in the later session, despite this being his first appearance at the Hockenheimring in F1. Carlos Sainz complained of balance problems on his Renault, leaving him off Hulkenberg’s pace in both practices. McLaren used FP1 as a test session, using a range of parts on the car for the first time. As a result, Stoffel Vandoorne was last both times, while Fernando Alonso was just outside the top 10 in the morning and fell back in the afternoon, leaving McLaren facing another Q1 exit if they can’t improve tomorrow. Williams were another team to bring new parts to this race, carrying out extensive testing on a new front wing. Lance Stroll appeared to have found some pace in the morning, but he and Sergey Sirotkin finished FP2 18th and 19th respectively. There was little to separate the two Toro Rosso drivers, as Brendon Hartley ended FP1 just off Sainz’s pace and around 0.2s quicker than teammate Pierre Gasly, before the Frenchman edged ahead later in the day. 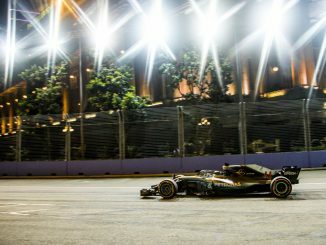 The team’s pace was stronger than McLaren’s and Williams’ but Sauber, Renault and Force India all seem to have them beaten.